Great Florida Smiles & Orthodontics provide dental implants to individuals who have lost their teeth. A small titanium post replaces missing tooth roots. The procedure isn't painful and any discomfort is managed with over-the-counter anti-inflammatory medication, like ibuprofen, or pain-relievers. Ice can also help relieve inflammation. The procedure is quite simple. The titanium post is inserted into your jawbone and takes 3 to 6 months to fuse to the rest of the bone. Allergies are rare. The titanium post is biocompatible, so tissue rejection shouldn't occur, but you'll still need to visit your doctor throughout those few months to ensure no tissue rejection takes place. You'll receive a temporary crown to get you through those months. After those few months, you'll go back to your Santa Rosa Beach and DeFuniak Springs dentist. They'll insert a screw and abutment in the post to attach a porcelain crown matching the rest of your teeth. Dental implants are advantageous in many ways. They can replace a single tooth, or multiple teeth, just View Examples, and support dentures. They're also one of the most successful restorative procedures, more than 95 percent success rate, and help restore bit and chewing function. Not everyone is a good candidate for dental implants, so you need to consult your doctor first. Your dentist will provide a complete oral examination, which include x-rays, to determine your procedural candidacy. Please schedule a consultation if you're interested in learning more about dental implants. Call your Santa Rosa Beach and DeFuniak Springs, FL, dentist today! 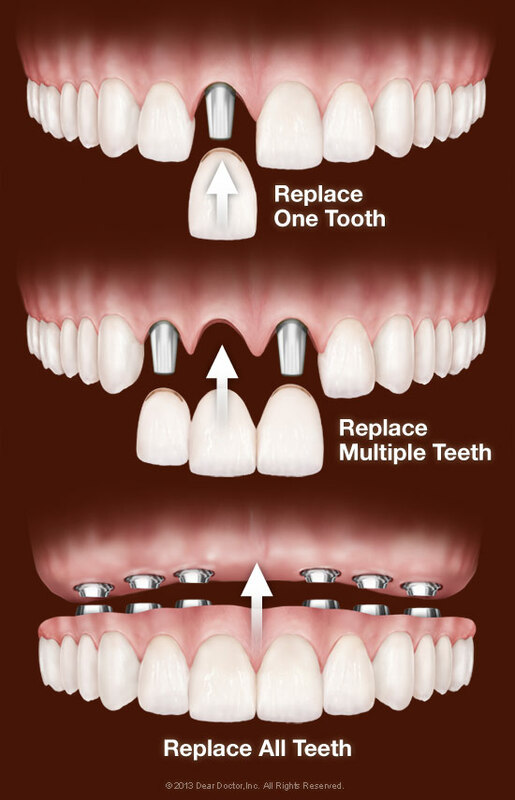 You can fill those gaps and replace missing teeth for the long term with dental implants. If you think about dental crowns, bridges, dentures and other restorations, we know that at some point these restorations are going to need to be repaired or replaced. After all, they aren’t meant to last forever. Of course, the same cannot be said for dental implants. Not only are implants made from thick, durable titanium but they also fuse together with the jawbone to become a permanent structure within the mouth. Once the implant has fused with the jawbone it’s meant to last a lifetime. Just ask your dentists in Santa Rosa Beach and DeFuniak Springs. Even just losing one permanent tooth can be enough to affect your speech or make it challenging to chew your food properly. Fortunately, just by getting a dental implant we can completely restore speech, get rid of speech impediments caused by tooth loss and even make it easier to chew all your favorite foods again. Don’t feel self-conscious again about going out to dinner; dental implants have your back! Most people know that when they lose a tooth that the jawbone will also be affected. This is because the jawbone requires full stimulation from the roots of the tooth. When the tooth is extracted or falls out, the jawbone no longer gets the complete stimulation it needs. As a result, the jawbone begins to deteriorate. While other restorations can replace missing teeth (e.g. dentures) they cannot prevent the jawbone from deteriorating. The only restoration that can is a dental implant because it is meant to take the place of tooth roots (and it even fuses together naturally with the bone). Are you interested in finding out more about dental implants and how they can revive your smile? We thought so! If so, your next step is to schedule a consultation with Great Florida Smiles & Orthodontics in Santa Rosa Beach and DeFuniak Springs FL, today.